People seem to fall into one of two camps on brussels sprouts – you either love them or hate them. Though I was only introduced to them within the past few years, I have firmly asserted myself as being in the love camp. This is in large part due to my favorite salad of all time (thanks, Josie!) but I have branched out from there and am always finding more and more ways to enjoy them. As a bonus, I love that they look like tiny baby cabbages. 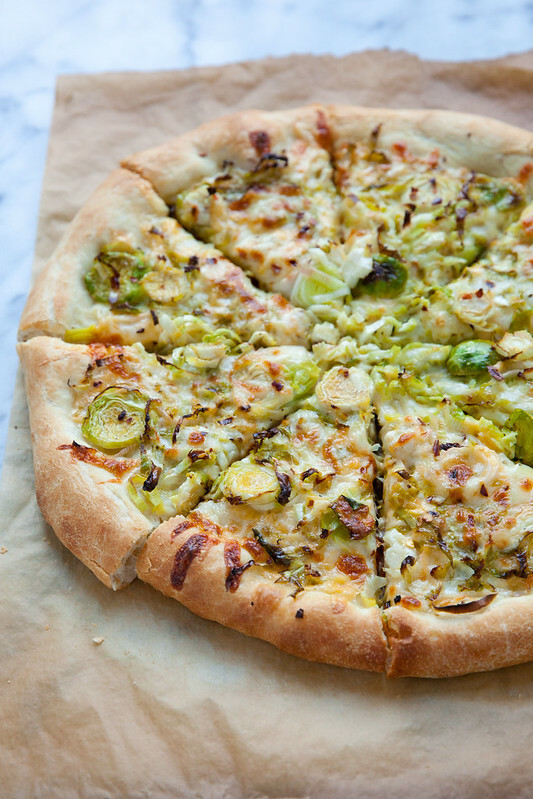 I’ve been considering some form of brussels sprout pizza for a while and finally decided to take a shot at it. 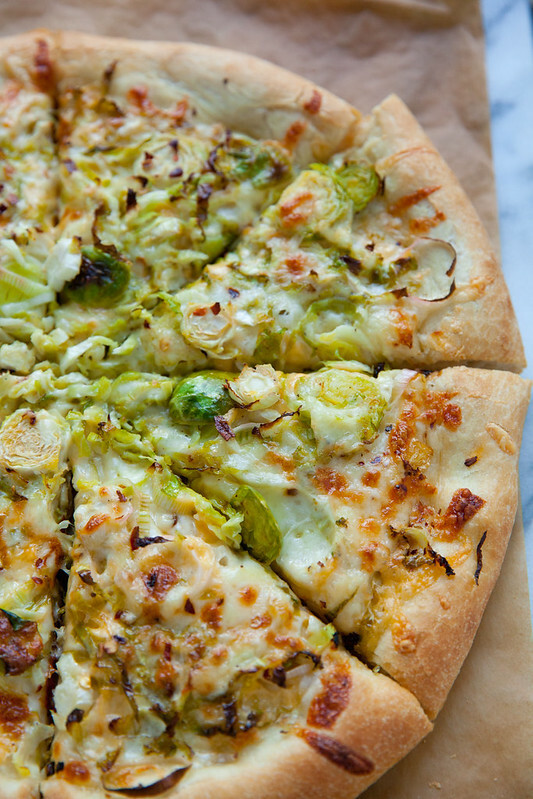 This pizza is simple but so fantastic with thinly sliced brussels sprouts, leeks, gouda, a touch of lemon, and red pepper flakes. I was texting with some girlfriends while I was making this. 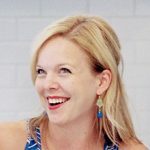 We enjoy regular pizza + wine nights at least once a month at our favorite pizza place that always has lots of incredible seasonal combinations with unique names. When I told them what I was making, they 1) agreed it sounded amazing, and 2) proposed we call it “The Annie”. I think that has a pretty nice ring to it, but I might be biased. Either way, this is a great dish to bridge the gap between winter and spring. If you are the sort that thinks a pizza requires meat, bacon would be a nice addition here. However, last time I made this, I used smoked gouda instead of regular and found that it had a bacon-esque flavor without the bacon. Total win! As a bonus, the kids love this as leftovers in their lunchbox so I make an extra pizza for that purpose. Enjoy! Place a pizza stone in the oven and heat to 500˚ F. Preheat for at least 30 minutes. Roll out the pizza dough into a 12-14 inch round on a piece of parchment paper. Lightly brush the perimeter of the dough with olive oil. In a medium bowl, gently toss the sliced brussels sprouts with the olive oil, salt and pepper, lemon zest and lemon juice. Sprinkle the shredded gouda and mozzarella over the round of pizza dough. Top with the brussels sprouts in an even layer, followed by the leeks. Sprinkle with the red pepper flakes. Transfer the pizza to the preheated pizza stone by sliding the parchment with the assembled pizza onto the stone, and bake until the cheese is melted and bubbling and the crust and toppings are lightly browned, about 10-12 minutes. Remove from the oven. Let cool slightly before slicing and serving.